Join the New Museum at the “Science Fair” for an interactive family showcase and demonstration of projects from NEW INC, the New Museum’s incubator for practices at the intersection of science, art, and technology. 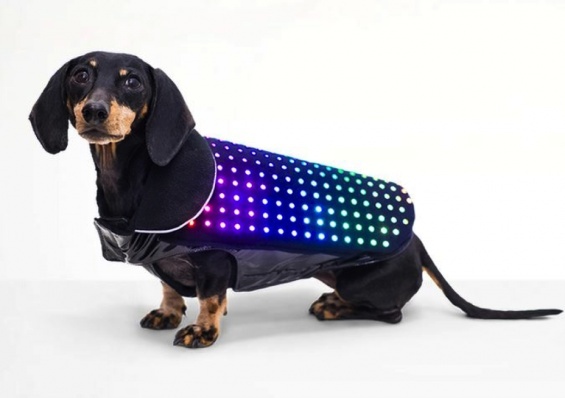 As part of this event, create animations for Disco Dog, the world’s first smartphone-controlled LED dog vest designed by creative lab PARTY; make music by licking popsicles in PopStars, an interactive popsicle orchestra by Emilie Baltz; and turn virtual ideas into real objects with designs by Print All Over Me. Museum educators will be on hand to facilitate hands-on projects for participants. New Museum First Saturdays for Families are free of charge. This program is designed and recommended for families with children aged between three and twelve years and includes free New Museum admission for up to two adults per family. Children under eighteen are always admitted free. No preregistration is required. Space is limited, and tickets are given out on a first-come, first-served basis. Your entire party must be present; tickets will not be given to partial parties. PARTY is a creative lab based in Tokyo and New York that specializes in bringing technology into the creative process to make amazing experiences and tell compelling stories. Avoiding “tech for tech’s sake,” PARTY focuses on finding ways that technology can increase emotional depth and bring magic to the things it makes. The team is a multidisciplinary group of designers, directors, and technologists who share a passionate addiction to making awesome stuff. Emilie Baltz is an artist, entrepreneur, and educator known for her work at the intersection of food and sensory storytelling. She has been commissioned to create projects for the Experimental Media and Performing Arts Center (EMPAC) at Rensselaer Polytechnic Institute in Troy, NY; Vitra Design Museum, Weil am Rhein, Germany; Bemis Center for Contemporary Arts, Omaha, NE; New Media Scotland, University of Edinburgh; Eyebeam, New York; Yale University, New Haven, CT; and the Museum of Art and Design, New York. She is a founding faculty member of the School of Visual Arts Products of Design MFA program and the creator of the Food Design Studio at the Pratt Institute, Brooklyn. Emilie is the author of the award-winning book L.O.V.E FOODBOOK, which received the award of Best First Cookbook in the World at the Prix Gourmand, and has also authored the nationally featured cookbook Junk Foodie: 51 Delicious Recipes for the Lowbrow Gourmand. Her speaking appearances include DLD, PSFK, TEDx, Ignite, Creative Mornings, TODAY Show, NBC, Wall Street Journal, and more. Founded by brother–sister duo Jesse and Meredith Finkelstein, Print All Over Me is a collaborative community and a space for collecting. It offers sets of objects for you to print all over to bring your digital artworks and images to life, as well as seasonal editions of new objects to serve as canvases for your ideas. This program is also made possible, in part, by the New York City Department of Cultural Affairs and the New York State Council on the Arts. Additional support is provided by the TD Charitable Foundation and the May and Samuel Rudin Family Foundation. Endowment support is provided by the Rockefeller Brothers Fund, the Skadden, Arps Education Programs Fund, and the William Randolph Hearst Endowed Fund for Education Programs at the New Museum.